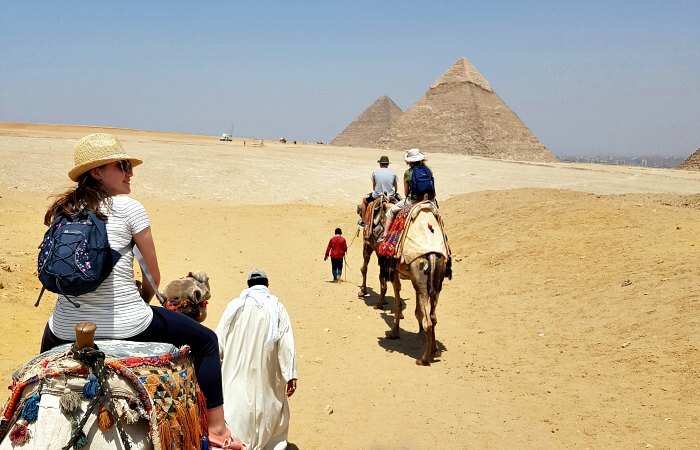 Steeped in six thousand years of history, Egypt is one of the world’s greatest travel destinations and is a land of timeless wonder, exotic charm and rich history. The tombs, temples and monuments from the Pharaonic era are the awe-inspiring showpiece to most Egypt family holidays. No one ever forgets the first time that they catch a glimpse of the Pyramids, rising from the desert in majestic splendour. The temple at Abu Simbel, painstakingly dismantled and re-built on higher ground to avoid the flood waters of the Aswan High Dam, is spectacular, as are the brilliantly painted tombs of the Pharaohs, lying under the barren desert ground on the west bank of the Nile. But there is also much more to Egypt family holidays than the ancient sites. Cairo is a bustling modern city with colourful labyrinthine bazaars, beautiful Coptic churches, serene and peaceful mosques and an imposing citadel. The desert scenery is extraordinarily varied and beautiful with strange wind-carved rock formations, rocky gorges, tiny oases and craggy mountains. And the waters of the Red Sea provide an abundance of underwater treasures. Not to forget the food….ooh the food. Plates of garlicky hummus, chick pea salads, silky smooth fuul and for the carnivores amongst us, succulent cubes of barbecued lamb. What’s not to like?! Egypt is possibly the perfect destination for a family holiday. The ancient sites will appeal to the whole family, as even the most recalcitrant adolescent will be bowled over the majesty of the ancient monuments. Toddlers will happily spend hours playing hide and seek amongst the soaring columns of temples dating back four thousand years. The Egyptians love children and will welcome you with open arms wherever you go. Tourism is very well established so there are excellent facilities and a wide range of hotels and restaurants to cater for every budget and taste. We’ve already mentioned the food, but whilst adventurous children will throw themselves into sampling all the local dishes, fussier eaters (yup, we’ve all got one of those) are also well catered for. This really is an ideal family destination. All of our Egypt family holidays are bespoke which means that they are tailor-made for your own specific family. We will always carefully take into account the ages of your children, your interests, your budget and so on. However, to give you an idea of what you could do on a family holiday in Egypt, and how this can be combined with neighbouring Jordan, have a look at our sample itineraries, Highlights of Egypt and Egypt & Jordan Highlights. Also have a look at some of the places that you might like to visit on your Egypt family holiday, check out our customer reviews and if you need further inspiration, have a look at our gallery at the top of this page..
Lastly, don’t forget to check what the weather will be like at the time that you want to travel. Or simply give us a ring and we’ll be delighted to advise you on the best holiday to Egypt for your family. Luxury Family Holidays – World trips with added WOW!